OKLAHOMA CITY – Legislation has been filed to bring Oklahoma’s poultry laws in line with U.S. Department of Agriculture standards. 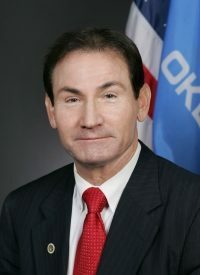 Sen. Ron Sharp (R-Shawnee) authored Senate Bill 995 to provide small farm exemptions from the Poultry Products Inspection Act, if the small farm abides by certain sanitary standards and only processes their own poultry. Sharp said if the state fails to update poultry laws, it could jeopardize poultry famers from qualifying for federal funds and contracts. “Being that agriculture is one of Oklahoma’s top industries, it’s important that we’re continually updating our laws to protect our farmers and ranchers. This bill will allow smaller poultry operations, that don’t have the funds to cover the regulatory costs, to compete at a local level,” Sharp explained. Under the bill, the products can only be sold within the state to certain establishments allowed by the particular exemption they choose. They would also be exempt from inspection requirements. Sharp, like his father, is seeking to protect the poultry industry through legislation. Halbert Sharp worked at the Oklahoma State Department of Agriculture from 1946 to 1981 and was tasked with overseeing weights and measures, poultry and eggs, fruits and vegetables, peanuts, meat inspections, feed and seed. He was also tasked with writing the poultry and egg laws for the state and the subsequent administrative rules for the inspection. The state has attempted to regulate the industry periodically through its history. After 1948, the state Department of Ag took over the inspection of flocks from the Oklahoma Poultry Improvement Association. Then in 1947, the state legislature passed HB 243 mandating dealers obtain a license from the Department to sell eggs. In 1957, HB 706 passed requiring egg grading of a certain quality to be sold and matched state standards to federal ones regarding egg size, quality and grade.